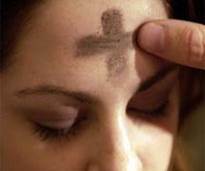 Lent annually begins with Ash Wednesday, where we as a global Church begin our forty days of penance to prepare us for the great Solemnity of Easter. Every year we have our own personal sins to show penance for, and this was traditionally a time for penitents to cover themselves in ashes as they sought to reconcile themselves to the Church through confession and penance. But let’s face it, our whole world is messed up, friends, so it is also a time for us collectively as Catholics to show our penance not only for our own sins, but for the sins of our times. Traditionally, we individually choose a personal penance to make during these days of Lent to draw us more attentively to the Lord, and our parish will begin our Friday Stations of the Cross and our Lenten Suppers as well. Fridays during this season are days of abstinence (no meat) and Ash Wednesday and Good Friday are also days of fasting, when we eat very little.